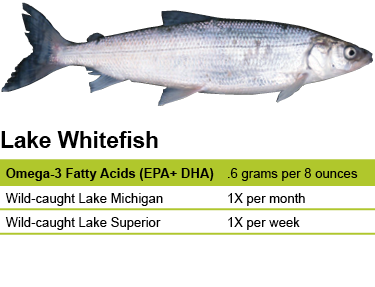 Lake whitefish is considered to have the finest flavor of any of Wisconsin’s commercial fishes, and it contains higher omega-3 fatty acid (EPA and DHA) levels than Atlantic cod. Whitefish are at their peak in colder weather when the meat tends to be firmer and fattier. The delicate, mild flavor is more like salmon than trout, and the flesh is medium-firm with a large flake. Whitefish are harvested in Lake Michigan and Lake Superior primarily with trap nets. Michigan has historically been a larger producer of whitefish than Wisconsin in Lake Superior; however, in recent years, the harvest has been roughly equal between the two states. There is not a fishery for whitefish in the Minnesota waters of Lake Superior. State health agencies have found that it is safe to eat Lake Superior whitefish once a week and Lake Michigan whitefish once a month. If you are unsure of the origin of your whitefish, you should follow the most restrictive recommendation (once a month). The Lake whitefish, a fast-growing member of the trout/salmon family Salmonidae, has long been a mainstay of the commercial catch in the Great Lakes because of its habit of schooling and its exceptional flavor. Lake whitefish are bottom-dwelling fish that feed on a wide variety of bottom-living invertebrates and small fishes. Predators of whitefish include lake trout, northern pike, burbot and walleye. Sea lamprey will feed on lake whitefish, but the impact on the populations is not great. Whitefish spend most of their time in Lake Michigan and Lake Superior between 100 and 300 feet, but they will move from deeper water into shallower water at night. They prefer to swim in schools, making them an easy target for commercial fishermen. Historically, lake whitefish played an important role in the Native American economy because of its ready availability. With the opening of the upper Midwest to European settlement, the lake whitefish was quickly exploited by fishermen. Lumbering and sawmill pollution also took their tolls in Lakes Superior and Michigan by covering up many whitefish spawning beds. While their numbers dropped dramatically from overfishing and pollution, lake whitefish have proven to be very resilient. Since they invaded the Great Lakes in the 1990s, zebra and quagga mussels have changed the food web of the Great Lakes, resulting in low numbers of the preferred food of lake whitefish—a tiny shrimplike creature called Diporeia. Recently fishermen have reported that whitefish have begun to adapt to this food shortage by eating other fish, despite their small mouths and lack of teeth. There is a popular ice sport fishery for lake whitefish in Green Bay.